Chevy Chase is one of the most sought-after places to live in D.C. It’s known for its eclectic mix of historic homes and sites, charming restaurants, and smaller local boutique shops. Living in Chevy Chase allows you to have the comforts of a smaller community while still remaining close to the greater DC area. This week, we’ll be focusing on the best local businesses servicing the Chevy Chase neighborhood in DC. Most of these are just a quick walk away from 5333 Connecticut, and truly reflect the friendly, home-grown atmosphere of the community. Core72 is a local shop specializing in women’s activewear and outdoor clothing. At Core72, you can find gear for exploring, running, hiking, yoga, gym, swimwear, and more. The owner is an avid trail runner and outdoors enthusiast and has extensive knowledge when it comes to women’s active gear. She is able to source quality, hard-to-find active gear, making their selection one the best in town. Located just a 5-minute walk form 5333 Connecticut Ave. apartments. 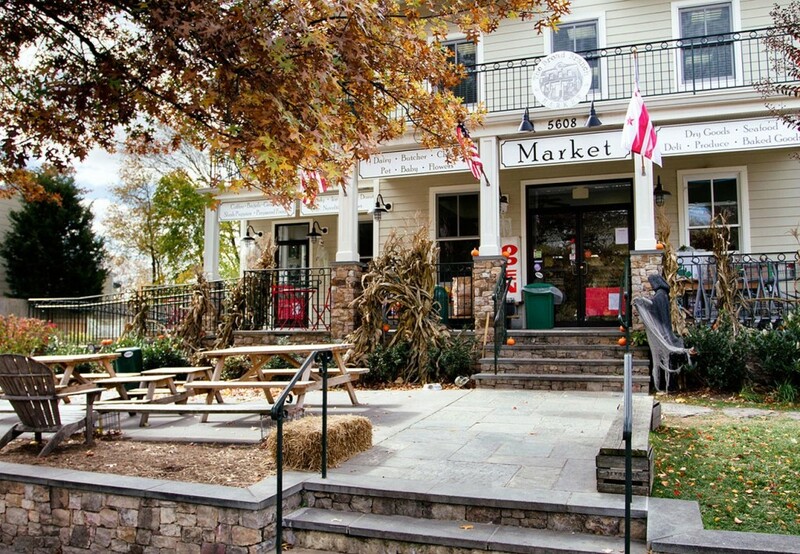 Broad Branch Market is a delightful, independently-owned community market in Chevy Chase. The store has high-quality grocery and basics selections, as well as gourmet food options. They also cater! Located on Broad Branch Road, the Market is also a favorite place for locals to pick up wines and craft beers. Broad Branch Market’s service really captures the neighbor-friendly spirit of Chevy Chase. Periwinkle is a hip little gift shop that offers a smorgasbord of gourmet chocolates, candies, and other specialty food products. Their products come from both local sources as well as from around the world. It’s a cute little shop to stop by if you need a quick gift on the run. They also have other fun items such as journals, soaps and dishes, frames, and other small items. Periwinkle is just down the street from 5333 Connecticut apartments. The fresh bonbons are highly recommended. Catch Can is a boutique store that sells a mix of clothing, home ware, and jewelry. They have some antique items as well, but their mainstay is their selection of women’s shoes and blouses. They carry many hard-to-find brands and unique fashion finds. The shop is just a 5 minute walk away on Connecticut Avenue, right in the heart of Chevy Chase’s famed shopping district. Catch Can has been serving the community for 15 years. Founded in 1986, Full of Beans is DC’s oldest children’s store. They keep a wide variety of children’s clothes, toys, and books in stock. The store carries some of the most adorable onesies, sweaters, hats, and other clothing items. This a great spot to bring your child for unique fashion not available in regular stores. It’s also an excellent place to shop for gifts for your nephew or niece. Barston’s Child’s Play is another children’s store in Chevy Chase that you can check out. This store sells highly customized, personal invitations for weddings and other formal events. These are some of the best, most uniquely crafted invitations you can get your hands on. ByHand Invitations embodies historic Chevy Chase’s commitment to preserving authentic, quality products and traditional craftsmanship. Since its inception, Chevy Chase was intended to be a quiet, yet interactive place full of character and charm. The community continues to live up to those standards through its unique local businesses and establishments. Are you interested in luxury living in Chevy Chase near all of these wonderful places? Contact us today to find out more about living at 5333 Connecticut Avenue, where you’re just a walk away from your next adventure.